Thanks to new funding from the city of Spokane, the House of Charity can resume housing the homeless on a 24/7 basis. For four months, the House of Charity provided shelter for essentially any adult who needed it. Men or women, sober or drunk, singles or couples — hundreds slept on the blue yoga mats lined up on the floor downstairs and in the beds upstairs. Unlike previous months, those sheltered wouldn't be asked to leave during the day. But the money that Catholic Charities and the city of Spokane hoped would flood in to keep the program going never arrived. 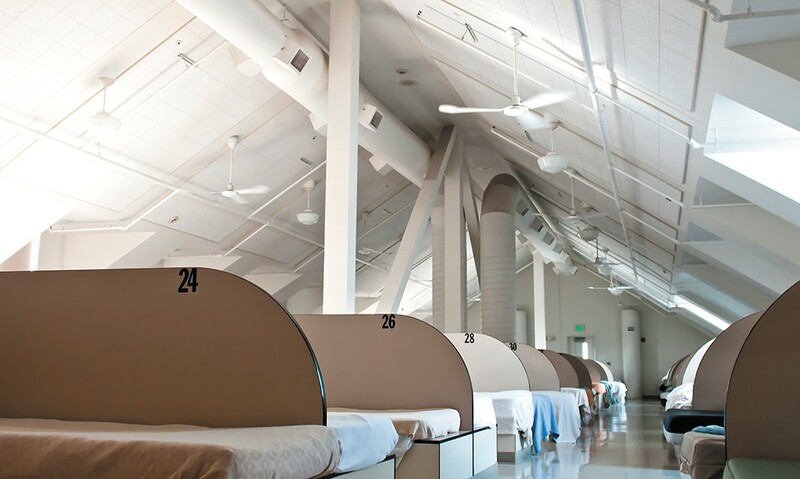 On May 1, House of Charity ended its overflow sleeping and its 24/7 shelter model. For weeks afterward, Jonathan Mallahan, the city's Community and Neighborhood Services Division Director, would walk the streets underneath the I-90 corridor nearly every day, and speak with the men and women who'd lost their shelter. He remembers speaking with one man in particular, a tall, lean man with long hair and stress in his eyes. "This one gentleman says, 'You guys just don't care,'" Mallahan says. "That is kind of the message we send. Homelessness is lonely. You already feel disconnected. And for something like this to happen, it does feel like, 'Here's one more piece of evidence that I don't matter.'" The city of Spokane has scrambled to pull together the resources to not only restart the 24/7 shelter program at House of Charity, but to ensure that the 24/7 shelter program citywide will survive long-term. Last week, the city agreed to dip into its reserves, taking $510,000 to restart the 24/7 shelter system at House of Charity for the rest of the year. And thanks to a major contribution from Providence Health Care, it now has enough money to keep the 24/7 shelters open through 2018. The challenge comes after that: The city wants to put an end to the roller coaster of shelter funding and finally provide a measure of long-term stability for years to come. For the city and nonprofits that serve the most vulnerable, the creation of a 24/7 shelter program was a triumph to be celebrated, even bragged about: Combined with a flood of housing for the chronically homeless, the city was on the crux, perhaps, of largely ending homelessness. Different nonprofits intersected to weave a safety net without holes: Crosswalk provided 24/7 shelter for teens, Family Promise for families, Hope House and Women's Hearth for women, and House of Charity for single people. Mallahan said back in November that if the city didn't raise enough money, all these gains were temporary. But he was an optimist. The problem was urgent enough, and the long-term savings were obvious enough, that he believed the city would find the nearly $600,000 extra to keep the program running through 2017. Some organizations stepped up. The Downtown Spokane Partnership, for example, helped raise $75,000 from local businesses. But with foundations and private funders low on cash, initial commitments evaporated. "The gap just grew," Mallahan says. Ultimately, the city cut off 24/7 shelter funding for House of Charity several weeks early, in order to ensure that the funding for Family Promise would last through the rest of the year. "I take it very personally," Mallahan says. "I take it as a personal failing that I couldn't find a way to make the pieces fall together." Eventually, reality set in: Despite months of meetings with other municipalities and organizations, the city was largely on its own to plug the gap and restart the 24/7 program at House of Charity. "If we're going to make things happen, we've got to do it ourselves, and we've got to do it now," Mallahan says. "And then work with others longer-term." But even with the city dipping into its reserves to offer the additional $510,000, Catholic Charities wasn't quite willing to bite yet. For years, the organization had been subject to one funding crisis after another: In addition to this year, House of Charity faced the threat of cutbacks to its hours and services in 2009, 2011, 2012 and 2016. Sometimes, last-minute outpourings of local generosity would save the day; sometimes they wouldn't. "Opening a program to run it for six months and then closing it... it's traumatic to staff, and traumatic to those who use our services," says Sam Dompier, House of Charity's director. Mallahan says that Catholic Charities wanted more of a guarantee of stability before agreeing to reopen 24/7. Within a span of a week and a half, the city was able to find that guarantee. Providence Health Care made a one-time $173,000 donation of charity-care dollars to the shelter. And the city promised an annual $250,000 increase in homeless funding, every year. That funding will come from a natural budget increase created by economic growth, but Mallahan recognizes that doesn't mean it's free. "It means other things won't get funded more, or will potentially be funded less," he says. Beyond 2018, funding is still uncertain. Crucially, instead of forcing organizations like Catholic Charities to apply for grants every year, the city will move to a long-term model, establishing five-year performance-based contracts. "That means less time for the shelter to try to show why we're a good shelter on paper, and more time trying to make it a good shelter in practice," Dompier says. "Less filling out paperwork, more boots on the ground." But the city still needs more funding. Mallahan is once again counting on other local governments to come to the rescue. "I do expect we're going to have good, productive conversations with [Spokane] Valley and the county on how to achieve this goal," Mallahan says. To some degree, Spokane County has already been fighting homelessness for years. "The county puts in millions of dollars into both the shelter side and also into developing transitional housing," says County Commissioner Shelly O'Quinn. Indeed, Spokane County has directed funding toward mental health treatment and housing for the homeless. It has also traditionally distributed grants, obtained through document recording fees, to local homeless shelters. During the past two years, however, House of Charity hasn't been on the list. Catholic Charities had made St. Margaret's Shelter a higher priority than House of Charity in its funding request, and Spokane County wasn't able to fund both. Yet last June, the county donated $50,000 from its mental-health funds to help keep House of Charity open. And the county's preliminary plan for the next two years has $135,000 earmarked for House of Charity. Mark Richard, president of the Downtown Spokane Partnership and former county commissioner, recognizes that the county doesn't have slack in its budget, but suggests that future tax increases could include additional funds for shelters. "If they're going to put out a ballot measure that's going to address public safety and regional parks, let's ask them to help take care of our homeless and most in need," Richard says. The Valley is a lot more skeptical. While the city met with the county and Catholic Charities, Spokane Valley Mayor Rod Higgins declined to show up to the meeting. Higgins says that, while he has met with Spokane Mayor David Condon separately to talk about this issue, he objected to Catholic Charities being at the meeting without other charities present. "It was unbalanced," Higgins says. "It was not supposed to be that way. We were misled." Spokane Valley has a bone-deep philosophical objection to the notion that it's the government's role to try to solve these sorts of problems. While it has a pool of $150,000 annually that nonprofits can apply for, Higgins says the Valley is skeptical of putting a line item in its budget for the homeless. "For one thing, we're not in the social service business, I guess is the best way I put it," he says. "If you are prioritizing, [homeless shelters] would not be something I would care to go out to ask taxes for." That doesn't mean Valley residents don't care about the homeless, Higgins says. He suggests they give personally instead of the government "reaching into [their] pocketbook" and forcing them to give. Mallahan says he recognizes that the House of Charity model may not be perfect. For all the successes of the 24/7 shelter, there were also problems to address: Some nearby businesses were frustrated with the increase in loitering and littering. There were two House of Charity norovirus outbreaks. And for homeless women who've experienced domestic violence, sleeping in a co-ed space near men can feel dangerous. "You may need a different environment to feel safe," Mallahan says. Ideally, he'd like to spread the burden of 24/7 shelter funding, providing another overflow shelter for women. He knows that could cost even more, but past failure hasn't stifled Mallahan's hopes.